Using bone meal for plants has been passed down for generations. It is made from ground animal bones and comes in a granular or powder form. When I did a lot of landscaping as a teenager and in my early 20s, I was using bone meal for almost all of my plantings, but then I learned about the potential risks and studied organic gardening and learned about a few superior products. Since the mid-1980s and especially the late-90s, there has been concern as to whether using bone meal for plants might be harmful, as inhaling the dust can cause a form of Mad Cow Disease in humans. I think there are a lot more important things to worry about, but if you’re into the precautionary principle, you might want to use something else. 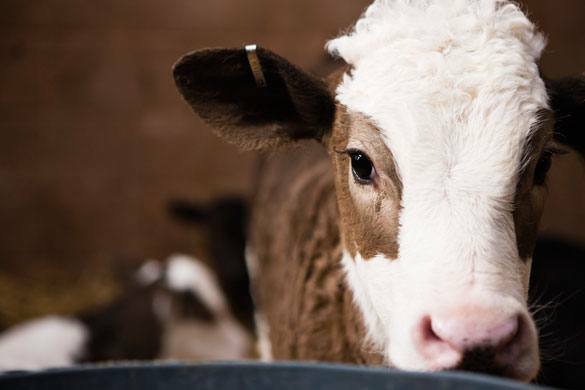 Many certification bodies in Europe and Canada (Source) have prohibited its use due to the risk of BSE contamination. Organic bone meal is often exempt, but almost impossible to find. It’s fairly difficult to guarantee the bone is free of prions, since the nerves run through the bones, and since it’s very difficult to kill them no matter how much heat and toxic chemicals are applied, so most of us organic gardeners just don’t use it. Many scientists claim there is little risk to humans from using bone meal for plants, but there are some who are seeing disturbing trends (here are some articles). I won’t get into the science here and I don’t pretend to understand it all, but I’ve decided to follow the precautionary principle and stay away from using bone meal in my organic garden. My goal is not to scare you away from using it, but just to let you know about this Mad Cow thing, and to let you know about some other great products you might want to look at instead. What Is The Purpose Of Using Bone Meal For Plants? Bone meal supplies phosphorus and a few other elements, but conventional and organic gardeners mainly use it for the phosphorus because it is supposedly important for root development, which is kind of true. The other things is, how do you know you need phosphorus? Maybe your soil has enough or too much already, and adding more might just throw the nutrient balance in the soil more out of whack. Adding any concentrated minerals just for “good measure” is inappropriate, as it can set off a string of unintended reactions in the soil. Good organic gardening practice is to add specific minerals only when you know you need them, generally based on an organic soil test, and using bone meal for plants is no different. What Might You Use Instead? What you use instead of bone meal for plants depends on how much effort you want to put into this, but the cost isn’t much and neither is the time. There are the 3 products I generally use when planting in my organic garden. Update: Some people say I’m scare-mongering with this post. I actually thought I was pretty laid back about the whole thing. It’s important for me to note that this is just a blog post. It’s not meant to be an authoritative dissertation with all kinds of sources. Indeed, a lot of the chatter about using bone meal and Mad Cow Disease is over 10 years old (like this website) and I don’t know much about the research going on now – it’s just that when I was studying organic gardening, I was taught to avoid using it because my national organic standard didn’t allow it, and still does’t allow it. You’re certainly welcome to use it. I’m not trying to offend or scare anyone. Have a nice day! Thank you for the recipe. I didn’t know about any of these products. Wow, that is seriously helpful! I just mix the wet seeds with some mycorrhizal fungi powder and then leavethem to dry from there. They don’t need to be soaked again. The only reasonI leave them to dry is because some small seeds are difficult to sow whenwet. I don’t want them to be bone dry, just easier to sow. I started a company in Victoria, BC a few years ago called The OrganicGardener’s Pantry. It’s now run by my good friend Christina. She currentlysells Myke, but is in the process of transitioning back to a superiormycorrhizal product that I used to carry.I would check out her website to see her prices on Myke (http://www.gardenerspantry.ca/… orcontact her to see when she’ll move back to the other product. So I’m looking a piece of land which is under a court sell because the previous owner was using the acres to bury Mad Cows. I’ve been told that if I want to grow there I’ll need to do some consulting with the Ministry of Health before they allow food to be sold off that land.Any thoughts? Should this really be a concern? It could definitely be a concern. I don’t know all of the details about theprions associated with Mad Cow Disease, but they are extremely difficult todestroy and they will definitely still be viable in that soil and they arepotentially quite dangerous to humans. If you grew the food in a differentarea than the buried cows, I’m not sure if that would be a problem. Hi. Love your e-mails. Want to comment on Mad Cow Disease. I am a hospice nurse and have actually seen someone with Mad Cow die. Not pretty. Also I was in Europe in early 80’s when Mad Cow was discovered as factor. No knowing then immed that it was being tranferred to humans, I did eat beef. Now I can nolonger donate blood which I did regularly most of my life prior to that and have to live with knowing I might be harboring the disease. It is unlikely but the risk remains. It is a difficult disease to eradicate and No One should take a risk of being exposed to it in anyway. The gentleman who is looking at the land should go elsewhere and that land should be a toxic waste site. Thanks for your insights Saluda. So what do you use that is better than bone meal? With grass I often mix a mycorrhizal fungi powder in with the seed before I spread it. Then I come by after seeding with a mix of sea minerals and kelp (and probably compost tea or EM) that I spray on the ground. Or if you have the ability to spread moist seed, you can soak the seeds overnight in the organic planting recipe and then put the fungi powder on right before you spread the seed.I don’t worry too much about binding the seed to the soil soil. Most important to me is keeping the seed moist. As most of my garden is planted, if I watered in the ‘MF’ will it survive, grow and eventually find its way to the various roots? If the MF does grow throughout the soil will this eliminate the need to apply it at the next planting? If your soil is porous, the MF will get down there and you won’t have toapply it at the next planting. I tend to wait until spring or fall to applyit when it’s a bit cooler and wetter, but fungi can take it a little drier.As long as your garden is occasionally watered, you should be good to gonow. this guys nuts or whomever wrote this been using it for years no funny biz lol no”mad cow”…. bonemeal’s just fine, just use dust particle mask or lightly moisten meal& wear gardening gloves soil microbes love bone & blood meal.But for alternative i recommend Jamaican bat guano or peruvian sea guano they r awesome but expensive compared to bone meals for phosphorous nutrient…. Hi Phil, are you a bloke? Using ml instead of oz? Just hassling you for fun.I enjoy reading your lessons. I’m a Canadian, eh? We’re metric. Recently, I used bone meal to fertilize carrots, potatoes, and beets, and even ate them. Can I be sure that the bone meal was not derived from downed cows? You only need one prion particle to be permanently ill.
You bone meal didn’t come from 20 year old British dairy cows. Most countries only had a few cases and those cases where long ago.Also it takes millions or prions to successfully pass along the infection between cattle. That is why muscle meat is large noninfectious but nerve tissue, digestive tract, and a few other organs are highly infectious. “Most experts” say it is safe but one person who cannot name the sources of his “information” says not. Mmmm, I wonder who I would give scientific credance to?I heard somewhere just isn’t good enough. Hi Sam, most experts said 2,4-D was safe, too. But it’s true, there are certainly more dangerous products out there than bone meal. But the potential for bone meal to cause a worldwide epidemic is there in the future if we don’t clean up for our farming system. So for me, it’s more of a principle than me being worried about contracting BSE-related illnesses right now. Oh please! It’s been 25 YEARS since the big scare and predictions of frightening epidemics of horrible diseases. The entire English population should be crippled and dying by now! THIS HAS NOT HAPPENED. Not even slightly. If there’s no hint of it after 25 YEARS, it AINT GONNA HAPPEN!!! This author’s recommendations in the link at the end of the article are actually good, but the silly scaremongering about BSE is just that. BSE was caused by organophosphate poisoning of UK cows, not some weirdo slow acting mutant virus. I can see I need to expand on this article and refer to sources. I’ll do that soon. BSE is caused by prion. It is similar to a disease in sheep called scrapy which has been around for millenia. A prion is a damaged version of a particular protein molecule which is capable of converting helthy version of the same molecule into the damaged version. It is not a virus. it is not caused by organophosphates. the “experts ” also said it was safe to clean up the oil spills and 9/11,and look how many people got sick and died! You go ahead and trust the” experts”,who probably have a financial connection to the product.If there’s a safer alternative,wouldn’t you want to use it,better safe than sorry. The bone meal I always get is ground up FISH bone. Ya, that’s fishbone meal and it’s good stuff. Nothing to worry about (that I’m aware of) there. Hi Rocío, sometimes it’s early harvest time, but often it’s seed cultivars. Perhaps you can find seeds online. Hi Phil,Do you have a recommendation for plants to grow that will clean up excessive P and K from the soil? I had a soil test a few years ago and the P and K were both so far off the charts, I wouldn’t think about adding more intentionally, but is it true that the P and K, even at very high numbers may not be available to the plants? As you said above that the MF “are often specifically credited with bringing phosphorus to plant roots, which is a good thing because plants have a difficult time getting phosphorus out of the soil, since it is held very tightly”. I have used EM-1 from Arbico Organics and they also recommended Nitron Micro-Nutrients which is Fe .10, Mn .05, and Zn .05. I did not do a very good job of using the EM, but plan to do much better about it this year since reading your blog! So back to my question, do you know about specific plants that I can grow that will bring my soil’s P and K into a better range (I had read about this once, but can’t remember exactly what it was). Or is this something that I should even be concerned about? Thank you!Also, would be interested in better understanding the use of Sea Minerals. I always thought that ocean water was high in sodium, (and thus bad for plants) but is this a myth? Or is the sea mineral product desalinated somehow, leaving beneficial minerals behind? Hi Ruminantia, it’s a big question you’ve asked, and unfortunately, I can’t get into too much detail here. The first thing to do about the Phosphorus and Potassium is don’t add any fresh manure, and not too much compost. As for plants that balance the P and K, that’s more difficult. There are plants that will bring certain nutrients up from deeper in the soil, but as for removing specifically P and K from the soil and keeping it out, that’s a little far fetched – a lot of the nutrients will just return to the soil at leaf drop. I would be more likely to soil test and if K is indeed high, there are certain mineral fertilizers that can knock some the K out of the soil. P is a little trickier, but I wouldn’t worry about having too much P – just don’t add more.As for sea minerals, I know it’s not all that logical, but the salt is not a problem. I wouldn’t use it if I had a salt problem already, and of course I don’t go dumping a whole lot of it on the soil, but a little is good. Although I was leery because of factory farm practices I recently bought some Bone Meal but haven’t used it yet. I was told that it was good to use with blood meal to give transplants a good start. Is this right or is there something better? I do use manure/compost tea, and rock dust too. My question is would the earth worm neutralize anything bad in the bone meal?My response to “Visitor” is that they have found the Alzheimer’s disease is possibly the human form of Mad Cow in some cases. I’d rather be safe! Earthworms won’t neutralize the prions in bone meal. Almost nothing can destroy prions, even very high temperatures. It sounds like you already have a great setup with your teas and rock dusts. Personally, I would skip the bone meal. Prions are protein and therefore fairly heat resistant. Bacteria in the soil can/do eat prions. Hi Phil,I have SEA-90, a cristalized sea mineral product. When I dilute with water (1tsp/gal) how do I apply to plants and soil? A sprayer? A watering can? Yes, assuming the sea solids will go through a filter, either of the above will work or a hose-end sprayer. Some kind of sprayer is nice to get full leaf coverage. Hi Phil, I’ve been wondering how long these products last, — mycorrhizal fungi powder, EM, sea minerals, kelp, rock dust, etc. — do they expire? I’ve purchased some of these through amazon, and don’t see indication on them. Of course, probably like many of your readers, I’m also always interested in brand/source recommendations in the US. I did see and appreciate the blog post you did on some products you reviewed that are sold on amazon. 🙂 Have a good weekend! Hi Heather – they should have an expiry date. Microbial inoculants are often best used with a couple of years. Biostimulants are more like a few years. It should say though.As for specific recommendations, I’ll have some in month 2 of the Academy within a couple of weeks. EM should be good up to 1 year from manufacture. keep all microbial innoculants in a cool dry place. the minerals should last a long time. Key Phil I love your posts. I am just 20 years old and you have given me years of skills a head of learning from people and the land. My knowledge of plant physiology leads me to belive that what you are saying is true. These additives (I’m guessing) are just very small amounts to give the plants a boost right after planting/ seeding. If you feed the plants roots they will not grow deeply to search for anymore nutrients or water. Thus making them I’ll prepared for harsher conditions later in the season.When planting started plants, lets say tomatoes, the fungi spores get dabbed on the outside after the water mixture is applied to the roots? Also I usually dig a trench first for many plants, tulip bulbs, carrots, peas, beans and more. Can I just equally pore the water mix in the trench? And sprinkle the fungi spores in the garden.Also once fungi is established should/ could you not work on making a small side area specifically set up to grow the mycorrhizae mushrooms. Like in a forested border along the side of your land. (the area you exploit for leaves? )I would also really appreciate it if you could start a resources page each with a number and then when you say a fact from one in a post put the associated number down on the fact.Thanks so much and I wish I could join your academy but I just do not have the time/ resources right now. Hi Charles, nice to have you here and I’m sorry you can’t do the Academy now, but hopefully you pick up a thing or 2 from my free stuff.Yes, you can pour the water mixture in the trench and ideally sprinkle the fungi spores right onto the seeds/roots while planting. As for propagating mycorrhizal fungi, that’s fairly tricky. Fortunately, once you have them in your soil, as long as you treat them well and don’t till much, they should stick around for you forever. I use organic bone meal- but doesn’t baking the bones before crushing them kill the BSE? No, the prions actually survive extremely high temperatures. I use it around flowers as it seems to keep the squirrels away . How about blood meal is that something a gardener should be concerned about? Hi Carol, sorry for the late reply – I missed this earlier. Blood meal has the same potential problem. Hi Phil,First of all I would like to thank you very much for your 15 lessons. I learnt a lot from your informations, even I applied my recent knowledge in my mother garden. She have big surprise because every year she and my father sprinkle the tomatoes with some non toxic pesticide, with nettle macerate.Also, we know that in some quantity it is action as fertilizer (1 liter at 10 l of water). Many times we apply on our vegetables , macerate nettle. But in small quantity 1 liter nettle at 1o l water its used as pesticide. This year I stop to aplly as insecticide . I would like to ask if you know that nettle macerate is good to be used as fertilizer? I bought this year some biostimulant , it contain fulvic acid ,humic acid and fitohormones, microorganisms.Also they said it has California worm. Is it good?I am ready for Academy.Thank you. Hi Pia, yes the nettle is a wonderful fertilizer. You’re lucky to have it! I can’t comment on the quality of your biostimulant without reading the label and ingredients and so on, but I reserve that service for Academy members because it takes some work on my end. But it sounds like a reasonable ingredient list. I’m not sure what the ‘California worm’ means, unless you mean worm compost, which has the potential to be great (unless you live far away from California and then it’s obviously not great for the environment to ship it). PhilI would exercise caution in using sea salt or kelp from the Pacific Ocean as evidence of radiation from Fukushima has been found in kelp off of the California coast. http://abcnews.go.com/blogs/he… from what I’ve been reading, the Fukushima plant has been, and is still, leaching radioactive water into the ocean and it’s being carried over to North America by the currents. Yes, thanks Dan. I did contact the manufacturer of the kelp I use and apparently analysis has been carried out by the marine biologists of the BC ministry of fisheries and ocean and although they did find some signs of increased radioactivity, they were not even close to levels that are known to endanger humans. While I don’t simply take their word for it, I do still feel fine about using it in the garden. Hi Jim, absolutely, you can actually do up to 1 cup per square foot of soil per year, watered in after. Hi Phil,Love your stuff thank you! I live by the ocean…are you saying that I can take the sea water and use it on my edibles? Do you remove the salt? Yes, you can use it at 1 cup per square foot of soil, probably just once or twice per year and then water it in. No need to remove the salt. does bone meal work good with snake plants? Hi Chickenfeet, it seems you didn’t read my article. I don’t use or recommend bone meal. Ummm…I did read your article but I am doing a science fair project where I test different types of fertilizer. Bone meal is one of my fertilizers so I wanted to know if a snake plant is a good plant to use. Please respond. It would be best to use something very fast growing like radishes from seed. They’ll be up a few days after seeding. HI Phil! I really like your blog and your excellent gardening tips. I agree with you that bone meal should not be used and I do not use it in my garden. However, I wish you had cited the naysayers who say we should not use it because there is a danger that using bone meal will contaminate your soil with prions that cause Mad Cow Disease. Please excuse me, but my common sense is causing me great difficulty in seeing how this could occur. Let’s say that I used bone meal when I planted my San Marzano tomatoes this spring. Are you trying to argue that any prions that might be in the bone meal would have been taken up by the roots of my tomato plants and thus become imbedded in the tomatoes themselves? Are you trying to imply that I will get Mad Cow Disease this way? Where is the scientific evidence for this? I agree with you that we should always be wary of what we put into our garden soil. But I do not have time for fear-mongering. I want hard science and practical tips that helps me to grow great vegetables. Hi again, Phil! Thanks so much for your quick reply to my post. When I clicked on the link I provided in that previous post about bone meal I got an error message. I am sorry that I used the phrase “fear-mongering” because it does appear that you were discussing the possible danger of using bone meal in a calm manner for those who might handle it or breathe it in. I think you are doing a great job in bringing these issues to our attention. We definitely seem to agree in general that bone meal should not be used in the garden and we can agree to disagree on the scientific reasons why that is so. Happy gardening to all! Oh, one extra thing Bruce. I’ll see if I can explain this succinctly. This lesson is on a hidden part of my website, but it’s also unlike most of my other lessons in that it’s published as a regular blog post on the public part of my website, too.That public post I had actually edited at some point in the last year to give it a softer tone and to link to a couple of sources. When you commented, I assumed you were commenting on that blog post because I forgot that this was also the 15th lesson (I answer comments from a backend system, so I don’t always know what post it’s on).Bottom line is that I hadn’t edited it here and you’re probably right that it was a little too harsh in its delivery, and probably didn’t have any links to the organic standards I was looking at, so I apologize for that. I have now updated it to the newer version. Thanks again, PhilP.S. I edited your original comment so the link will work. Good information – May I use some of your ideas in an article I’m writing on animal sources for organic fertilizers? Please respond I need to know. I’m using this website as a source if you don’t mind!!! Hi Phil. Thanks for all the usefull tips. I enjoy your blogs very much. Earlier this summer, i made some fungus with powdered baby oatmeal and added it to my compost tea process at the beginning of the brew and sprayed veggies and flowers in the evening. Also poured some next to some plants. Am i doing some good or just wasting time. Can i add a purchased MF fo compost tea at some point in the process to give the garden and lawn a boost from time to time or is there a better way, (other than when planting initially as you have descrbed).Thank you very much for blog. The oatmeal is not a bad idea, especially if you want more of a fungal-dominated tea, like if you’re using it for trees and shrubs. I’m sure it can’t hurt for veggies, too, but we’re especially interested in bacteria for those.Mycorrhizal fungi can be added to tea after it’s done brewing and then sprayed onto the soil with the tea. There’s no use spraying it on leaves, though, since the MF relationship is with the roots. Add anthrax to your concerns. Hallo, I put bonemeal over my plants and lawn. Since then, my dog, wire haired foxterrier does not want to put her foot(paw) outside anymore. Why? Hmmm, I don’t know. Some dogs actually like it. will it hurt your dog if they eat this bone meal? For had dog get into it and liked it a lot and did not seem to make him sick. Do you think it is okay to mix in there feed? My dad had hunting dogs and us to mix his own feed and used bone meal in it and the dog really did good on it. I wouldn’t recommend it for the same reasons mentioned above. This blog should be updated to note that not all bone meal is made from Cows. There are other bone meal products out there that are still organic. Miracle Grow even has a bone meal product that is not made from cow bones. Thanks for the tip, Amber. I don’t support Miracle Gro (Scotts), but you’re right, it’s an important distinction. As far as I know, porcine bone meal doesn’t cause problems. I just moved into an apartment and found a bag of organic bone meal that the previous tenants had left outside for maybe a year. I opened it to pour it out and it smelled and looked like feces. Do you think that’s what happens when bones decompose? It is hard to believe it is someone’s idea of a prank. I imagine a rodent got in there. if I have a packet of bone meal in India how should I dispose it safely so that it does not harm me or the environment ? Good question. I really have no idea. Perhaps sending it to the garbage dump is okay, or perhaps it should be sent where more toxic materials go. I am such a beginner!! !i only have passion for seeing plants grow and the environment sparkle with Life. But not knowledge at all. Your 15 lessons have made me aware of the depth of my ignorance and the amazing tapestry of knowledge and skills that are needed for the job – I thank you dearly for that while I take time to ponder what to do next. All the best wishes to you ang all growers who follow you. Ok, perhaps you will not think i am taken advantage of you if i seek your expertise with my experimentation….You see, I live in Tropical Australia – poor, clay soil and lots of seasonal rain. Being almost 60 I decided to overcome my inability to dig such a hard soil by planting directly into didderent size containers containing horse manure (I can purchase at a reasonable price. ) I am about to planti tropical fruit trees and vegetables for the wet season is amost over. Are you able to predict what I should expect from adopting this practice, and of course, some related advice.? If the horse manure is well composted, it may work out okay. If not, it can burn roots and cause other problems. I would rather see a mixture of perhaps 50% soil and 50% composted horse manure. Also, unless you have very big containers, there is not near enough room for the root system to grow, so the trees will stay fairly small and will be more prone to sickness. Foliar feeding with a mix of ocean water and water may help them get nutrients. I stopped using blood or bone meal after being told by a client that his mother had died that year from the human form of mad cow disease. She had been under the care of our state’s health science university. Her doctor said he had 10 people die that year of the disease and that every one of them was an organic gardener. I started using soft rock phosphate with good results. I ordered it in bulk. I used soybean meal for nitrogen and greensand for potassium. Also some trace minerals from the sea. The man who game me my tomato plant starts was amazed when he saw how much bigger my tomatoes were than his which were started at the same time from the same seeds. This is very disturbing! People all over the world are adding this to their gardens & inhaling it, not realizing the risk! Scary! Sea water has a multitude of beneficial minerals and also every toxic substance known/unknown thru direct dumping to runoff. Yes, I wouldn’t advise getting it from an industrial area. And even in the pristine areas there are unfortunately trace amounts of everything, but right now the benefits outweigh this. I’m currently trying to get my supplier to do some more testing on his product for toxins. In the case of mycorrhizal fungi, they remain in the forests because the forests aren’t being tilled or plowed or bulldozed. Our residential properties are a different story, so the fungi are often very much depressed. But yes, I agree that in the long run the goal should be to use not too much in the way of products. Just want to throw my 2 cents in here as I know a little bit about microbiology. The use of bone meal should not be a cause for concern or fear. Mad cow disease’s prions are only located within the nervous systems tissue (spinal cord / brain). The bones used for bone meal would not contain any prions because when a cow is found to have mad cow disease they are put down and disposed of. No part of the cow is used for any use to prevent the spread of the disease. There is a human form called Creutzfeldt-Jakob disease, but no cases have been identified within the USA. Mad cow disease is not truly an American problem but rather found in the UK mostly, and occasionally in Canada. The chances of you becoming ill from the use of bone meal are about as likely as being hit by a meteor. The plant does not consume any protiens (prions) from the bone meal because it cannot use them, but rather consumes the core elements like phosphorus and calcium. What it doesnt use it leaves behind. Really, there is no need to worry. If bones contained the prions for mad cow disease, do you think there would be beef stock? bone in steaks? For further reading check places like the CDC’s website. It’s always a good idea to check your references as a lot of misinformation is out there. Thanks for your comments William. I agree there are a lot of more important things to worry about, but of course it would work out that this is one of my articles that a lot of people seem to find – jeepers! My understanding is that the nervous system runs through the bones. That’s why organic agriculture standards around the world strictly forbid using bone meal unless it can be proven to come from disease-free animals. There have been several cases of variant Creutzfeldt-Jakob disease in the U.S., but not many. Same with Canada. We are talking about 3-4 cased.All of these cases were exposed outside of the U.S. and there only exposure was through eating beef.There are no cases of someone developing vCJD from exposure to bone meal. I bet you approve monsanto/scotts AGENT ORANGE, ROUND UP SEED GMO’s and CANOLA OIL originally: (lubricant / pesticide).EU farmers eradicated Mad Cow Disease the instant they eliminatedCANOLA OIL and GMO Feed. EBOLI too.satanic illuminati rothschild monsanto scotts, Fortune 500. Federal Reserve, FED. NWO. uncle sam. OWG one world gov. same entity us of a CORP / INC. Act of 1871. The other America. Do you know what the nitrogen content is as I am trying to heat up strawbales in Colorado and want to do it organically.Te extension office said to use urea at 45 %, and a Pueblo office said to use liquid lawn fertilizer.I want to go organic, but need the strawbales to heat up and cool alittle before planting seeds, and sweet potatoes.It is almost time to plant and the bales have only heated up to 80 degrees and cool down at night.Please any thoughts or suggestions would be helpful. I haven’t done the kind of straw bale gardening you’re implying, but my recommendation would be a sustainably-produced organic liquid fish fertilizer. I try not to use much of it because there are sustainability issues, but it is very good for nitrogen. Also, you may want to group the bales together to get more mass going, and keep them moist to encourage microbial activity. Is sea minerals the water from the sea and liquid kelp the mushed up kelps from the sea? Yes, sea minerals is ocean water, except it’s concentrated down many times. And yes, liquid kelp is basically mushed up kelp from the ocean. Phil – thanks so much for the lessons. I’ve learned a great deal, to give up some things I still have kept using and reinforcement for things I’d given up on. My question today concerns an avacado tree we started from seed which is now in a 10 gal container and about 4′ tall (hip high). I’m getting ready to transplant it into a larger container. Since alvacado will not live through the winters here in the GA mountains, how can I keep it healty in a larger container that I can move into the greenhouse for the winter and let out for the rest of the year. My goal, of course, is to get avacados – lots of them!. There are other fruit trees that I would like to grow also like olive and citrus. Would your “tea” be good for container trees as well? How often do you apply or only when transplanting? I apply some kind of foliar spray as often as every week and as seldom as every 1-2 months. Eventually, you want to put that tree in a big container or right in the soil, and instead of moving the tree, move the greenhouse (or take of the plastic). I don’t have much experience with that kind of thing, but that’s what I’d do. Thanks Phil. I never thought of moving the greenhouse. I guess I’d need to figure out how to get that done. A fruit bearing avacado can get pretty big. I supppose I could build a frame and put something like bubble wrap around it during the winter, mulch really thick around the base so the roots wouldn’t freeze. Here the freeze typically goes down around 2″ maybe 4-5″ of mulch out at least a foot beyond the leaves, would that work? Something like that could work. I couldn’t say for sure. And you can prune the tree to keep it smaller although of course that isn’t the best for the tree so it may have more health/pest issues. Is this fungi the same as that in bean and pea innoculant? No, the bean/pea inoculant is a special bacteria, not a fungi. Just this summer I “discovered” how easy it is to make compost or worm castings tea in 50 gallon barrels with molasses and powdered kelp with fungi. For smaller scale gardeners, a 5 gallon bucket is just as easy. The results are evident within a week and it is a viable substitute for bone meal. Yes, it’s beautiful stuff for sure. Thanks for sharing John. For nitrogen, I mostly use good compost, plus legume cover crops in the winter to build up more nitrogen. But when a boost is needed, a liquid fish hydrolysate is a wonderful help – I don’t use it much anymore because I don’t think it’s sustainable, but it is useful product. Another one is organic alfalfa meal. My friend Christina runs my old business ( http://www.gardenerspantry.ca ) and sells the liquid fish and some other awesome stuff. Thanks for sharing. But don’t nerves run through all bones in the body? Considering the functions that nerves carry out: 1) to transmit signals from the brain to cause muscles to contract; and 2) to provide the brain feedback from the environment, I find it highly unlikely that nerves would be found inside bones alongside marrow. The most sensible place for nerves to be found would on top of or alongside the muscle they are meant to communicate with and in proximity to the environment they are meant to sense.The sciatic nerve, for example exits the spine near the hip and runs along various muscles in the buttock and back of the leg.Even if you took a cross-section of a vertebra, you would see that the bone itself is sort of donut-shaped, and the spinal cord, the nerves, goes through the holes in the donuts of the vertebrae, not within the bones themselves.Getting back to bone-char, the problem is still one of separating the spinal cord and cranial nerves from the spine and skull. Barring that, one would have to separate the back and skull from the rest of the skeleton.Either way, it’s something I doubt would be cost-effective for a bone meal or bone char processor. Interesting, thanks again for the info. Will the sea minerals kelp etc be a risk with the high radioactive contamination from Japan now polluting the ocean? I’ve been asking sea minerals/kelp/fish manufacturers and trying to keep on top of any new information, and so far it seems to be entirely fine. I don’t know enough to make a comment on risks incurred using Bone Meal. However I DID stop using it, toward the end of last gardening season because it is not balanced in term of nutrients provided and I did notice a change in the foliage and not for the better. I do know people who use it and swear by it but my gut told me to find alternates so I did. I’m getting very good results with tomatoes (grape) and various peppers. Best ever actually with 4-way organic earth. This article about bone meal should not be viewed as a scare tactic. it is just one person’s opinion about one thing. People should do their own research about things that are safe to use in your garden. Use some common sense. If you depend on what experts say bout something then you might be misinformed. Experts are a lot like medical doctors. Ask seven of them about something and it is entirely possible to get seven conflicting answers. Also what the experts are saying about something now might be entirely different than what they say about the same thing a year or two from now. So long as the individuals in question weren’t murdered and their remains were disposed of with respect and in accordance with any existing family members’ wishes, I have no qualms about that.Our remains all get recycled into the environment eventually. I have read about cultures where the corpse is reverently laid out on a hillside where scavengers (vultures, mostly … ) are allowed to consume it. All true. Thanks for sharing Molly! Phil, I didn’t read through everything so the answer may be here but can you recommend a soil for a beginning Gardner that does not contain bone meal. As a vegetarian I didn’t want to use it but it is in all the conventional soil I have found. Organic is a must for me so I finally compromised and used Dr. Earth with fish bone meal but it has soy meal in it too which I would like to avoid as well. Any help you can give me? Sorry Melissa, I don’t keep track of branded soils. If I need soil, I buy it in bulk from a garden center, in which case it’s generally just plain topsoil, perhaps with some compost mixed in. And I generally only buy soil if I’m building a raised bed. If I already have soil and I just want to improve, I usually use just compost.